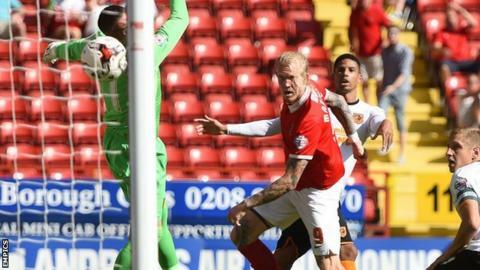 Charlton's Johann Berg Gudmundsson scored the winner in the eighth minute of added time as Hull City lost for the first time this season. Berg Gudmundsson's cross was headed in by Simon Makienok for the opener. It looked like the Tigers had pinched a point when Abel Hernandez scored from close range in the 89th minute. Hernandez then thought he had won it, only for his header to be ruled offside, before Berg Gudmundsson headed home deep in added time. There was little indication of the drama that was to come in a first half low on quality and chances, with home substitute Karlan Ahearne-Grant blazing the best opportunity over the bar just before the break. Dane Makienok gave the hosts a deserved lead when he headed in Berg Gudmundsson's centre and the midfielder nearly made it 2-0 minutes later when Allan McGregor blocked his shot when one-on-one. Hernandez saw a deflected effort go just wide before popping up with his first goal since 22 March, after Isaac Hayden had hit the post and seen his rebound blocked. The unbeaten Addicks won it when Makienok headed into the path of Berg Gudmundsson and the Icelander's header beat McGregor in the Hull goal. "This was an important win for the club, for the fans, for everyone. (On Makienok) "He has been playing very well but not scored. I know his quality and knew he would score, as he did. It was an important goal but he also helped us in other ways." "Funnily enough I felt the longer the game went on we were the team more likely to win it. Don't get me wrong, for an hour they deserved to win the match. "The first half was probably the worst I have seen in a long time, whether it was the heat or what I don't know but it was awful. "For 30 minutes against Fulham we were superb and if we play like that then there won't be many teams that can beat us. However, if we play like we did against Charlton for an hour then there won't be many teams who won't beat us." Match ends, Charlton Athletic 2, Hull City 1. Second Half ends, Charlton Athletic 2, Hull City 1. Goal! Charlton Athletic 2, Hull City 1. Johann Berg Gudmundsson (Charlton Athletic) header from very close range to the bottom right corner. Assisted by Simon Makienok with a headed pass. Corner, Charlton Athletic. Conceded by Moses Odubajo. Offside, Hull City. Sone Aluko tries a through ball, but Abel Hernández is caught offside. Attempt missed. Johann Berg Gudmundsson (Charlton Athletic) left footed shot from outside the box is high and wide to the left. Assisted by Regan Charles-Cook. Attempt missed. Callum Harriott (Charlton Athletic) right footed shot from outside the box misses to the right. Assisted by Ahmed Kashi. Delay in match Nick Pope (Charlton Athletic) because of an injury. Nick Pope (Charlton Athletic) wins a free kick in the defensive half. Corner, Hull City. Conceded by Morgan Fox. Abel Hernández (Hull City) is shown the yellow card for excessive celebration. Goal! Charlton Athletic 1, Hull City 1. Abel Hernández (Hull City) left footed shot from very close range to the bottom right corner. Attempt saved. Isaac Hayden (Hull City) right footed shot from outside the box is saved in the centre of the goal. Assisted by Sam Clucas. Isaac Hayden (Hull City) hits the left post with a right footed shot from outside the box. Simon Makienok (Charlton Athletic) wins a free kick on the right wing. Attempt missed. Nikica Jelavic (Hull City) header from the centre of the box misses to the right. Assisted by Isaac Hayden with a cross. Corner, Hull City. Conceded by Patrick Bauer. Attempt blocked. Abel Hernández (Hull City) left footed shot from the right side of the box is blocked. Assisted by David Meyler. Attempt missed. Sone Aluko (Hull City) left footed shot from outside the box misses to the left. Assisted by Ahmed Elmohamady. Attempt saved. Callum Harriott (Charlton Athletic) right footed shot from the centre of the box is saved in the centre of the goal. Assisted by Simon Makienok. Attempt missed. Regan Charles-Cook (Charlton Athletic) right footed shot from the right side of the box is high and wide to the right. Assisted by Callum Harriott following a corner. Corner, Charlton Athletic. Conceded by Allan McGregor. Corner, Charlton Athletic. Conceded by Curtis Davies. Substitution, Hull City. Sam Clucas replaces Andrew Robertson. Zakarya Bergdich (Charlton Athletic) is shown the yellow card. Attempt missed. Sone Aluko (Hull City) left footed shot from outside the box is high and wide to the left. Assisted by Abel Hernández. Attempt saved. Jordan Cousins (Charlton Athletic) left footed shot from outside the box is saved in the bottom right corner. Attempt missed. David Meyler (Hull City) right footed shot from outside the box is high and wide to the right. Attempt blocked. Andrew Robertson (Hull City) left footed shot from outside the box is blocked. Assisted by Sone Aluko. Substitution, Charlton Athletic. Regan Charles-Cook replaces El-Hadji Ba because of an injury.